FlatMode: I met Bob Haro! The other day, Fat took Chad Johnston and I to the Transworld Media Headquarters in Carlsbad, California. Bob Haro and skateboarder Chris Miller lead a discussion about being an entrepreneur in the action sports industry. 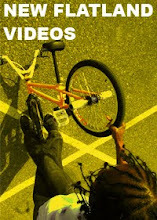 If you don't know who Bob Haro is, he's the guy who started all this trick stuff on BMX bikes. If you read this blog, Bob Haro is the reason. Legend Mr Haro i salute you,he started the revolution and created our lives.